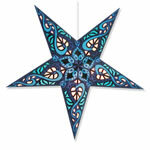 Paper-backed cutouts make this paper star lantern glow like a stained glass window. 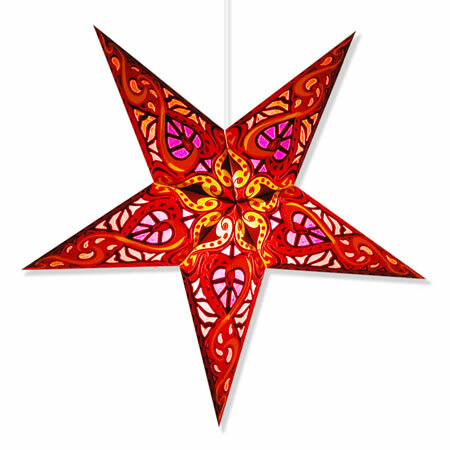 Star lantern measures about 24" across and 6" deep, ships flat with complete assembly instructions. 12' electric cord with on/off switch optional for a little more. 40 watt lightbulb not included. Click here to see a video of our paper star lanterns that will give you a feel for how they look in person! 5 point green star lantern with tissue covered cut outs. 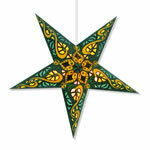 5 point star lantern with tissue covered cut outs. Hanging paper star lantern with tissue paper backed cut outs.